Welcome to the 45th Annual Stowe Winter Carnival Website for the 2019 Activities. Please feel free to browse this site, and please join us, in celebrating our theme, “to Stowe and Beyond…” during the 2019 Stowe Winter Carnival in January! Stowe Winter Carnival Opening and Closing weekends’ festivities at Rusty Nail Stage and The Matterhorn feature fabulous musical talent! 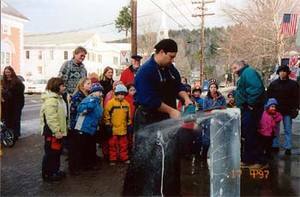 Stroll, up and down Main Street and Mountain Road, during Demonstration Day, Friday, Jan. 25th, when Professional ice Carvers sculpt in front of businesses and resorts. Meet and greet the Ice Carvers at the Ice Carver’s Welcoming Party at the Sunset Grille on Friday Jan. 25th, after the Ice Carving Demonstrations. Don’t miss the Nineteenth Annual NICA Ice Carving Competition, Saturday, Jan. 26th, 12:00-4:00 pm @ The Alchemist Brewery, 100 Cottage Club Rd., Stowe, when Professional ice Carvers carve to the theme “OUTER SPACE” , while using their extraordinary talent and risk taking! Join other families at the Stowe Rec. Dept. sponsored Ice Fishing Derby on Saturday morning Sat. Jan 25th (equipment provided at Commodores Inn) before watching Ice carvers at the 19th NICA Ice Carving Competition! For other “ On Snow” sports, On Sunday Jan. 27th, come out with a foursome for the classic Snowgolf Tournament-dress in futuristic costumes “To Stowe and Beyond and bring your modified club! Registration location TBA….Or gather six players and join the Snowvolleyball Tournament at The Sunset Grille and come play in our winter wonderland of Stowe!